It's home to some of the best – and prettiest – surf spots in the world. Canada is the ultimate destination for outdoor activities – skiing, hiking, ice hockey, curling, chopping wood… One that rarely makes the list, however, is surfing – it should, though, because hanging off the west coast of Vancouver Island is the blissful little town of Tofino, home to some of the best – and prettiest – surf spots in the world. Sitting at the tip of a peninsula in the Clayoquot Sound, just above the spectacular Pacific Rim National Park, Tofino might be surrounded by rugged wilderness, but it’s so laidback it’s contagious. The minute you arrive, cruising past sandy hitchhikers and bohemian cafes, you’ll feel that easy-going seaside attitude sink in – just like Australia’s Byron Bay (before it got a Woolies). It’s not just the swell that gives Tofino its hippie lifestyle. The largest environmental protests in Canadian history took place here in the ’80s and early ’90s, when local residents and First Nations bands took on the logging industry in the so-called “War in the Woods”. Sustainability is seriously engrained in the Tofino ethos, and when you see how magical the landscape is, you’ll understand why. The wild, white-sand beaches of Pacific Rim are breathtaking, whether you surf or not. If you’re keen to catch some waves, Long Beach is the largest and most popular spot inside the national park. For beginners, Chesterman and Cox beaches are less challenging. There are many places to rent a board or book lessons, including Surf Sister, who started in the ’90s with all-female instructors to encourage more women to get, er, on board. You’re in Canada, though, so remember that, even in summer, it’s bloody cold in the water! If you’d rather stay dry, Pacific Rim has some short but incredible hiking trails, taking you from lush rainforest to the coast. 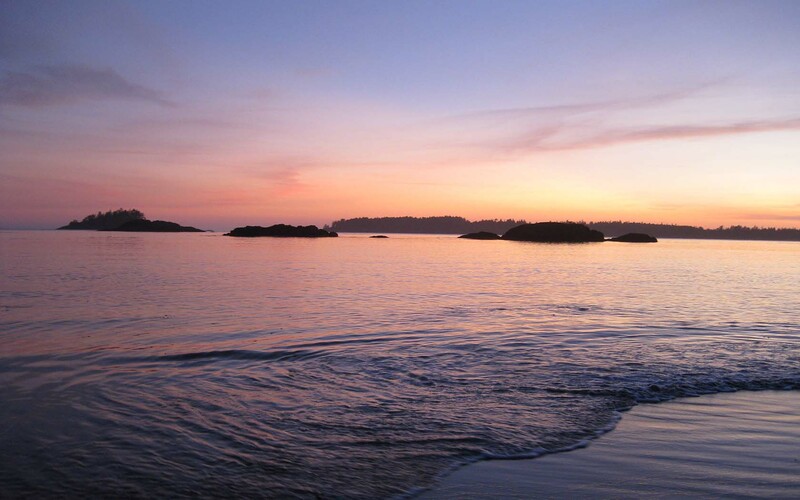 A short boat, kayak or seaplane trip will take you to the many beautiful islands surrounding Tofino. On Meares Island, to the east, you can hike among some of the largest, most ancient trees in the world – reaching circumferences up to 18m and up to 1500 years old. If you’re up for a challenge, take on the Lone Cone trail: an epic hike up to Meares’ highest peak. With 730m of elevation in just over 3km, it’s seriously steep – but the view at the top is beyond worth it. Even if you don’t hike, it’s worth an overnight trip – there’s a campground and hostel right on the beachfront, with spectacular views and a hot tub to watch the sun set from. Rooms start from $30 per night, including your return water taxi, so it’s hard to say no. Further north, in the Maquinna Provincial Park, you can sink into geothermal hot springs overlooking the open ocean. Naturally formed by rock crevices at the edge of the rainforest, the tides create mineral-rich pools of different temperatures, so you can find your perfect spa. It’s an hour and a half boat trip to Hot Springs Cove, during which you might see grey whales, sea otters, eagles or even orcas. Your first port of call after a day at the beach should be the tasting room at Tofino Brewing Co. Located in an industrial park (just like Byron Bay’s Stone & Wood), the craft brewery is so hip that they sell their own plaid shirts – and the beers are tasty as hell. Grab a growler of their Cosmic Wave IPA or unique kelp-infused stout, then pop next door for a killer burger from Red Can Gourmet. For a more upmarket dinner, try Wolf In The Fog – a restaurant down by the water that uses locally sourced seasonal produce for their share plates and delicious cocktails. From Vancouver, the best way to get to Tofino is to drive – the views are incredible! You can take the ferry to Nanaimo with your car, from $75, then take the scenic three-hour highway past mountains and lakes to Tofino. If you don’t have a car, you can catch the bus for around $56; it’s a 7.5-hour journey.